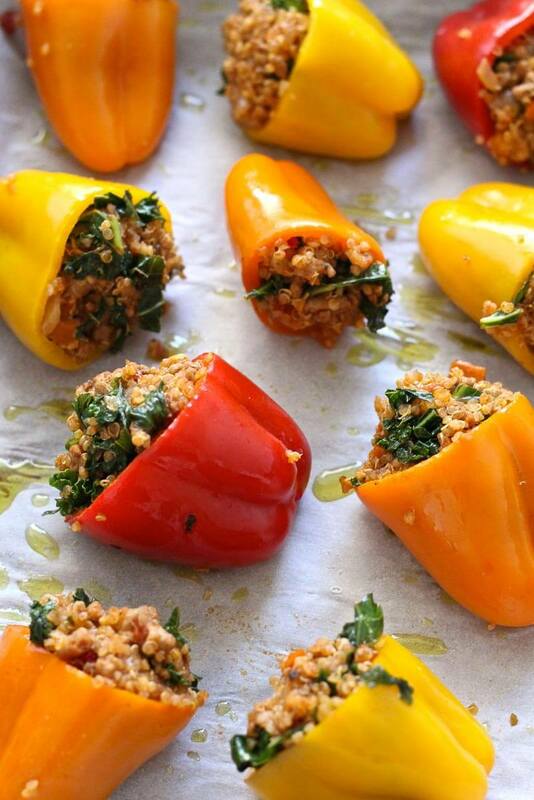 These Quinoa and Turkey Stuffed Mini Bell Peppers are the perfect go-to meal for those busy weeks ahead in the fall! Preheat oven to 375 degrees. Cut tops off peppers (set those aside to cook later) and remove the white pithy parts of the peppers. Drizzle with olive oil and season with salt and pepper and cook in oven, with tin foil covering pan, for 15 min. Meanwhile, heat olive oil in large frying pan and add onions and garlic, cooking for 1-2 min until fragrant. Add turkey, chili powder, cumin, salt and pepper and cook for about 5 min on med-high heat, breaking turkey up with spoon. At the same time, cook quinoa according to package directions and chop kale. Add salsa and quinoa and cook for another 3-4 min. Add kale and cook for 2 min until leaves are slightly softened.